Since 1975, the Archdiocesan Chorus of Detroit has served as the resident choir of the Archbishop of Detroit, leading music for the major archdiocesan liturgies. 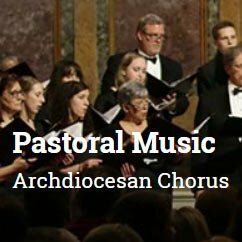 With a diverse membership of talented music directors and parish choir singers, the Chorus also serves as Southeast Michigan’s forum for Roman Catholic sacred music. The Chorus regularly works with local universities and local churches of all denominations, singing Gregorian chant, classical choral standards, liturgical music, and premieres of new compositions. For further information, visit the Archdiocesan Chorus of Detroit website.